Pivot Points are used to establish key points of support and resistance. The traditional methodology for calculating Pivot Points is to use the trading range from the previous daily interval candle, however they can also be calculated on any time frame to suit the strategy being developed. R1 The first potential level of resistance above the Pivot Point line. 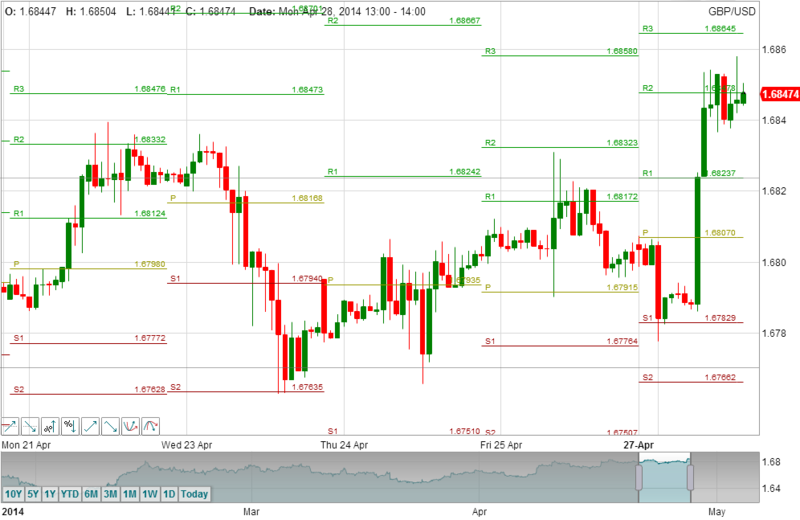 During periods of low volatility the price will contained with the R1 level. S1 The first potential level of support below the Pivot Point line. During periods of low volatility the price will contained with the S1 level. R2 The second potential level of resistance above the Pivot Point line. During periods of normal trading volatility the price will be contained with the R2. S2 The second potential level of support below the Pivot Point line. During periods of normal trading volatility the price will be contained with the S2. R3 The third potential level of resistance above the Pivot Point line. Only during periods of high volatility will the price break through the R3 Pivot Point resistance level. S3 The third potential level of support below the Pivot Point line. Only during periods of high volatility will the price break through the S3 Pivot Point support level. As the price breaks through each consecutive Pivot Point level, the potential for greater return increases as the distance to the Mean central Pivot Point increases, however it also is associated with higher risk as the price volatility is increasing. For Momentum based trending strategies, a price break out through the upper third resistance or support pivot point can be used to open a long or short position respectively. After a breakout through the R3 or S3 level, it can take the price a while to converge back to the central Pivot Point line, therefore consider using a shorter interval trending indicator like a traditional Moving Average or MACD crossovers to exit Momentum based positions. 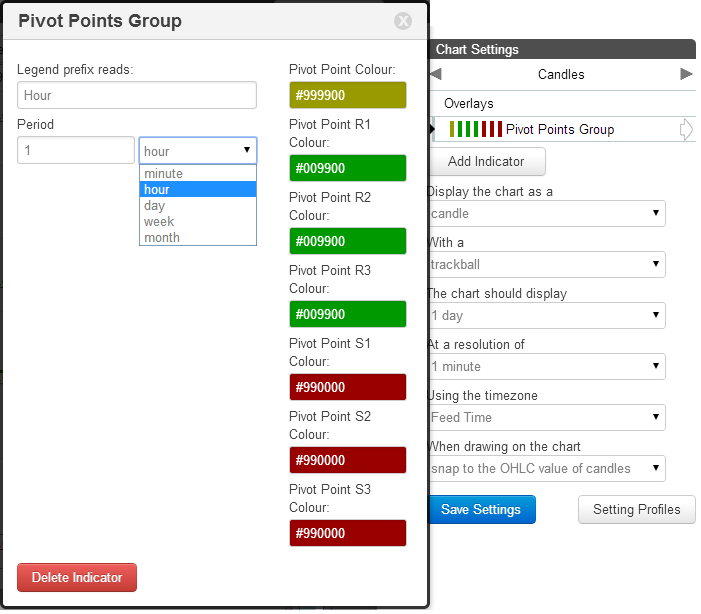 Traditionally Pivot Points are calculated on a daily interval candle. It can however be advantageous to use alternative time frame, such as 1 hour for more frequent intra day trading. A potential advantage of Pivot Points based on shorter interval periods is that if there is a strong directional move within a day, if the Pivot Point is based on an intra day interval, the central Pivot Point Line will converge on the new price level closing out the position, most likely at a loss, but allowing new trading opportunities to be capitalised upon. 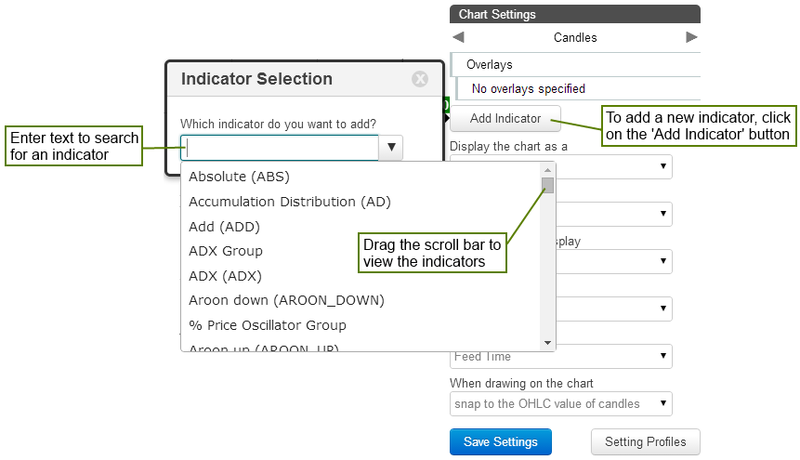 After adding the Pivot Points indicator, within the chart settings, click on it to set the parameters and change colours.